• SVN is a group of mainly retired teachers, and others who have worked in education. • They are committed to help with short-term educational projects, usually overseas. • SVN makes no charge for this help. • Projects typically range from one to five weeks. • SVN does not undertake projects focused on mission or evangelism. • It does not provide money, either for specific projects or ongoing work, but only supplies volunteers. • Volunteers do not teach classes in schools, but support and train those who do. A team of nine volunteers spent two weeks in Zambia running training workshops for primary and secondary teachers from a number of schools. Three volunteers have been to India to help the Principal and staff of a Christian school with an evaluation of their work, leading to the development of an improvement plan. 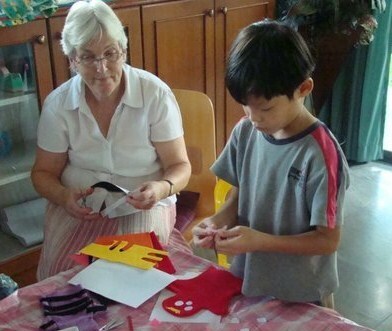 SVN has an ongoing work in Thailand with the OMF missionary society, bringing home-schooled children together for a creative arts week, and giving them the experience of learning together. Volunteers have visited Bangladesh to help establish a TEFL course. The request was for a six-month visit, but this was too long a period for SVN volunteers, so two people went for several weeks each. One SVN member gave tuition and support by email to the daughter of a missionary family in Spain to help her with IGCSE exams, following a short visit to meet her. SVN is developing links with other charities of similar philosophy and operating style, but which lack educational expertise. This will enable joint projects to be arranged, adding an educational input to existing charitable work. Projects are currently being undertaken with Mission Direct and Links International, and we have completed a first project with Smile International. Increasing numbers of requests are made to SVN for help with Special Needs. Many volunteers have experience in teaching and training teachers of those with disabilities and learning difficulties of all kinds. Visits have been made to help schools train and equip classroom teachers, to support mission agencies and home schooling, as well as to develop school SN policies and curricula. Further information on SVN can be found on our About Us page or in Frequently Asked Questions. If you would like to discuss a possible project, please get in touch with us via our Contact page. "I realise just how much the parents need by way of support ... practical suggestions with respect to teaching, after all they aren't all trained teachers, and most of all they need reassurance and encouragement." Helping at a conference in Africa for children who are being home-schooled.